Belgium, Bruges or Ghent, ca. 1490. Gift of William S. Glazier; 1984. John, Lord Northwick, his sale, London, Sotheby's, May 21, 1928, lot 8; Maggs Brothers Ltd., London; purchased in Sept. 1950 from Maggs for William S. Glazier (1907-1962), New York; deposited in the Pierpont Morgan Library by the Trustees of the Glazier Collection in 1963. Ms. book of hours single leaf (cutting); illuminated in Bruges or Ghent, Belgium, ca. 1490. 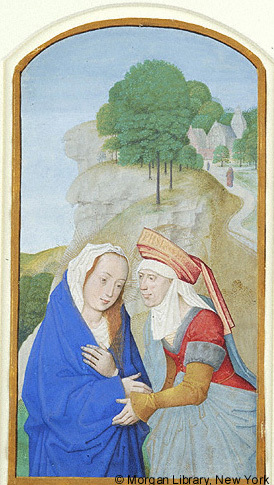 Decoration: 1 miniature depicting the Visitation. Artist: possibly the Master of the Older Prayerbook of Maximilian I, or Sanders Bening, or Gerard Horenbout. Three other miniatures from the same series were sold at the Lord Northwick sale (lots 9-11); an Adoration of the Magi, probably from the same series, is in the collection of Bernard Breslauer, New York--Cf. Twenty-first report to the Fellows of the Pierpont Morgan Library, 1984-1986.